Pour faire ce HF, rendez vous au dernier boss et allez à droite de la pièce vous verrez une plateforme en contrebas avec un assemblage désactivé. Pour l'activer il faut faire passer la technique Reflet lenticulaire du Grand sage Viryx sur le boss. Désignez un joueur qui ira se sacrifier en bas (il ne doit pas mourir, une plume de mage, iceblock, bubule ou lévitation par exemple). Maintenant solotable si vous avez un pet pour garder le combat engagé. Au niveau 120 : très facile, pas besoin de tuer le boss. Entrez sur la plateforme du boss sans l'attaquer. Repérez l'assemblage déchargé sur une petite plateforme en contrebas, sur la droite, contre le mur. Attaquez le boss pour engager le combat : ne le tuez pas ! Juste un petit coup, puis sautez sur la plateforme. Si un piaf vous saisit, butez-le. Après quelques secondes, il va provoquer un rayon de lumière jaune pour vous toucher : le rayon doit frapper l'assemblage. L'assemblage prend vie et devient agressif, tuez-le. Et voilà ! Vous ne pourrez pas remonter sur la plateforme du boss, sautez sur l'étage en-dessous et retournez tuer le boss tranquillou. Enhance! Contrast! Tint! Bright! Sleep mode! Vertical hold! Does anyone have an idea how to do this achievement? Okay, this is probably the most wierd achievement I've done, but here it goes. For us, this made it so the add was now Alive(It Did NOT reset). Did this today. If you die, you won't get the achievement. Stay on top of him so he doesn't knock you off. Did this today, someone said you can send one down before hand. 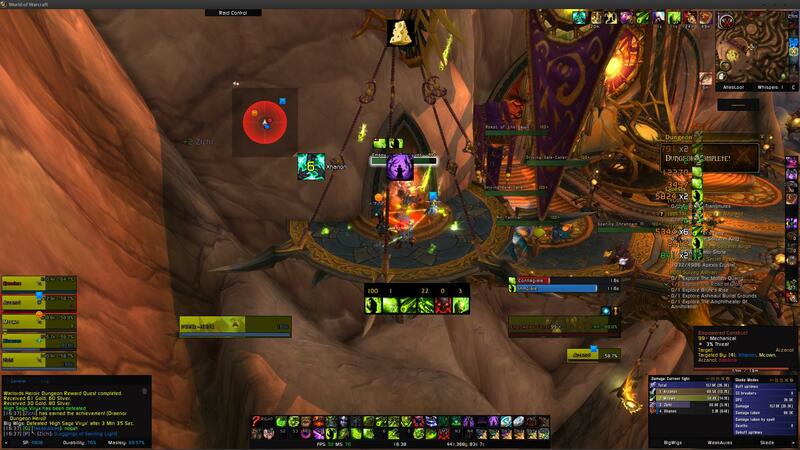 We had a pally go down there before we engaged and he never got the Focusing Iris. We're not sure if its a range issue or because he never got into combat with the boss (I didn't check). We ended up having a mage get the Iris while on the platform and them jump/blink down. The last tick activated the construct. The construct started as normal, we killed the boss, the people below died and ran back, then we all jumped down together killed him and got the achievement. Hi just soloed this as a BM hunter. Note you still need to have a decent group to get to this point. I just joined a random heroic we were all over geared so they didn't need my dps for last boss so i jumped down onto the platform and got the lens flare and activated the mob. after boss was defeated and rand back used a nice glider to reduce fall speed. Make sure to dismiss pet first. landed on platform, called pet, let it tank always have mend pet up. for mechanics it will occasionally shoot out a beam of light don't stand in it causes massive damage, and he will also do a knock-back so you need to be in middle of platform to not fall off and die. This achievement can be done at the same time as Monomanie. Before engaging Grand sage Viryx, go to the right of his platform and look down. You'll see a very tiny Assemblage déchargé on a small platform. Have one of your damage dealers jump down to the platform. Please note, if you don't have any slow-falling spell on you (e.g. a Voleur's or Mage's Chute lente), you need to jump on top of the spikes sticking out of the pillar wall to not die from fall damage. Have the rest of the group engage Grand sage Viryx and wait until his Reflet lenticulaire targets the party member standing on top of the Assemblage déchargé. The Assemblage déchargé will become an Assemblage investi, making it active. The party member can now either let himself die or use any self-defensive ability. Let the rest of the group finish off Grand sage Viryx, and have them jump down to where Assemblage investi is and kill it. The inactive construct can be very hard to see. It is on a platform on the outside and it is tiny. After you can killed all the trash on the way to the last boss, you can go to the right side of his platform, look down and see it again. You can see the platform to the left of the left-most pack before the second boss - and if you can target it there and put a raid marker on it, it will be easier to see when you get to the last boss. Also, it is HARD to jump down to it - but I have always been a lousy jumper (hello balcony outside LBRS/UBRS back in the day). If you are soloing this at lvl 110, just DPS boss slowly until her beam comes out (Great Spire's Focusing Iris) then just drop over the edge of the platform (carefully!) to the construct platform below. The beam will follow you down and once you get the Lens Flare debuff from the beam the construct will activate. Kill the construct to get the achievement. Easy as. Like so many other things, this is (relatively) easy to solo once you know how. Two things to know first: Viryx is going to reset after you're down on that platform, and the beam will hit you almost immediately. The trick is to be down on that platform while the beam is activating. Don't worry about the boss reset, and don't worry about fall damage. I don't know when the boss casts what or if there's a specific timer, but I'd DPS her down to about 50-60% or so and just stop. I also marked the construct so it was easier to get my bearings after dropping down. She'd cast Solar Burst, then call for help, then activate the Focusing Iris. I found that if I fought her there at the edge above the platform, I could then fight the zealot that grabbed me and kill it once I was past the edge, drop down to the platform, then be standing at the construct as the beam hit me. Took more than one attempt to figure out the right timing. After killing the construct, you'll see where you can jump off the platform to run back up if you want to nuke the boss. To earn this achievement you have to visit Orée-du-Ciel instance and find there Grand sage Viryx boss. Empowered Constructs located on small pads under the main pad, where the boss is. You have to pull boss close the edge of the main pad (be sure, you can kill adds asap) and with until solar beam casted. Jump down and let the beam hit the constrict. Few second later the constrict will be charged and attack you. Kill it and you will get the achievement. You dont have to defeat the boss. Seems bugged at the moment, beam hits small add, add grows but can't be attacked. Update for 7.3: Just did this achievement as a 110 hunter. I set my pet on hold command at the edge and let it taunt the boss so the boss had something to aggro. It doesn't seem as of 10/21/17 that you can get this solo while on Mythic. Maybe it requires only to be on Heroic. It is possible to solo. Did it as a boomkin today. Stand near the edge and dps boss until below 50%. He should cast Cast Down. Let it carry you over the edge, kill the npc. You will fall to the platform. Use something to slow you like Flap or engineering cloak. He will cast Lens Flare on you and activate the construct. Kill it asap before the boss resets and you have the achievement. I killed the Empowered Construct on Mythic but didn't get credit. Just left the instance, turned it to Heroic, did it on the first try. 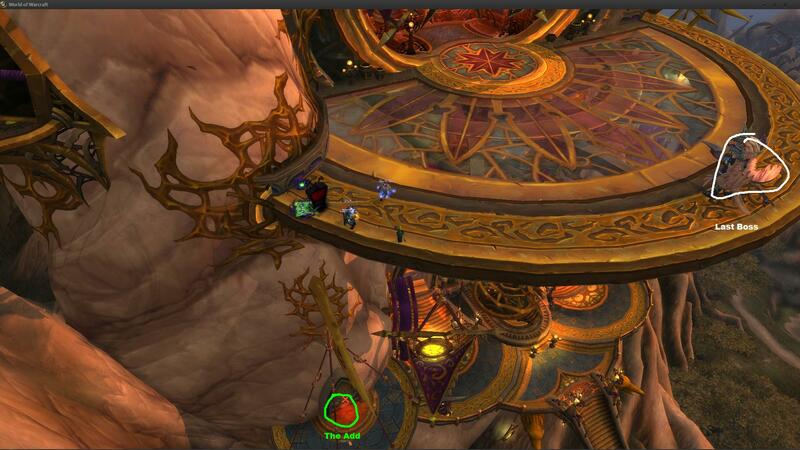 I just ran this dungeon on Heroic in 7.3 and there is no Uncharged Construct on the platform. I've fallen down multiple times, used a macro to try and target it (assuming I just didn't see it), made sure I killed all the trash - there's just nothing there. Did this achiewment solo just now as a Feral, I never saw the construct spawning on the platform below even with the boss at roughly 50 %. If you are trying to solo this and not sure when exactly to jump down - turn on in-game sound and jump as soon as she starts saying "Behold the might of arrakoa!" It is also a good idea to jump backwards, i.e. facing the top platform with your back towards the drop. That makes it easier to not miss the small platform with the construct. 3. Start fight, and only damage boss a little, say 25% at the very least. 4. Eventually a bird is going to pick you up, wait for it to carry you just over the edge of the platform. 5. Kill the bird that picked you up. 6. You will fall to a lower platform. The construct will assemble. 7. Kill the construct ASAP. I attempted this achievement today, but seems to be bugged. I did everything correct, fell to the platform below, she cast the beam, but no construct was there and nothing spawned. As soon as the cast was over, the boss reset. Attempted it several times, zoning in and out of dungeon, and even different toons, empowered construct never spawns. I submitted a bug report, just have to wait and see if something changes. Read the achievement text carefully. You can't get this one on Mythic difficulty. Don't be fooled by the presence of the Construct and the ability to make it grow, you cannot get this achievement on Mythic difficulty. Repeat, you cannot get this on Mythic difficulty. And just to make sure it gets into your thick skull, you can't get this achievement on Mythic difficulty! Happily, if you were a derp like me and still tried it on Mythic, you can exit the instance (talk to Reshad if you killed the last boss, or Shadow-Sage Iskar near where you came in if you didn't), flip that difficulty to Heroic, and head right back into the fray! Vaincre l’Assemblage alimenté à Orée-du-Ciel, en mode héroïque.